What looks to be the first picture of Fiji's self-appointed leader since he arrived home yesterday has appeared in FijiLive. 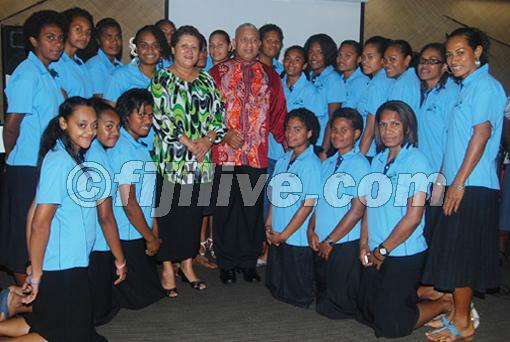 Bainimarama was at the Holiday Inn last night for the sponsorship launch for next year's World Netball Championship, in Singapore. The regime's leader looks a shadow of his former military hardman persona, with illness clearly showing on him. The regime has this week adopted a business as usual approach, refusing to acknowledge or confirm Bainimarama's ill-health, despite a sojourn to China where there was clearly little evidence he was conducting business as claimed. It's believed he was seeking medical treatment for either a stroke or a heart problem. Local Fiji media have bought into the pretence, ignoring the obvious change in physical appearance by Bainimarama, who had to cancel delivering yesterday's budget address. His first public engagement has instead been an ocsasion of a more lightweight nature, last night's netball launch, which he attended with his wife, Mary, the patron of the Netball Fiji squad. Your creative quotes are a bit like former Iraqi information Minister Muhammed Saeed al-Sahaf (see below). August 11 - The LA Times reports that the Iraqi military was itself fooled by the creative reporting of furloughed Iraqi Information Minister Muhammed Saeed al-Sahaf (M.S.S. ): "After the information minister claimed that Iraqi forces had retaken the Baghdad airport from U.S. troops, two former commanders said, Republican Guard Gen. Mohammed Daash was dispatched to check out a rumor that four or five American tanks had survived the Iraqi counterattack. Daash returned to his headquarters in a panic. "Four or five tanks!'' the commanders quoted Daash as telling his fellow generals. "Are you out of your minds? The whole damn American Army is at the airport!'' "
Voreqe will have a slow and painful death at Saint Giles where he rightfully belongs. Jake we Fiji Indians are in total control. Sir Khaiyum is single handedley running the country from Suvavou House while the rest of the dickhead Fijian Ministers follow all his orders or face being sacked. Aziz is the man on the ground barking out all the orders on the ground to the dumb and dickhead fijian military on the orders of Sir Khaiyum. Jake you you better believe it because just like your vu Voreqe you are in the grandmaster plan for the peaceful takeover of Fiji by Fiji Indians. Sir Khaiyum and Fiji Indians with brains will lead the Fiji economy to the benefit of all peoples of fiji not just corrupt politicians,chiefs, rich businessmen and dumb fiji military. We the itaukei know fully well that you kai Idia's are in control!! The Hindu kai Idia's further know that the MUSLIMS [May Allah rest in peace] ARE THE ONES IN CONTROL!!!! But like it will be another day tomorrow, we the itaukei are CONFIDENT that one day Mafato, rest in peace and be assured, we will rise from the ashes!!! Then we will see!!! So what if Voreqe has been sick, he is over 50 years old for goodness sake and within almost 5 years, he has finally gotten rid of the century old 3 institutions primarily responsible for Indigenous Fijian backwardness - LOTU (Methodist), Vanua (GCC) and MATANITU (Nationalistic, capitalist, hegemonic goverment). Believe me, anyone who destroys systems which have not favoured the poor regardless or race, the down trodden and the lonely is a servant of God Who works in mysterious ways for He uses, the unexpected (commoner, sickly, non-University educated), just as He identified His Son, with Joseph, a simple carpenter. Anon (12.48pm)it's only Qarase's supporters who're making this coup out to be against the Indigenous Fijians (IF) - trust me, most IF like what is going on and would not have a problem with an Indo-Fijian leading them. IFs are not stupid. They have seen the lies although Indo-Fijian leaders like Chaudhry also lie - they're more concerned with their needs being met NOT the racial background of the PM. As a medical professional, can I say that I detect nothing in this photo to support your assertions of a heart attack or stroke. In fact, it's inconceivable that having come off the plane from China so recently, Frank would be any social function if he'd been seriously ill. Yes, he does look a little worn around the edges but no more than anyone else after an overnight flight from Hong Kong and two weeks of Chinese banquets under his belt. Much as I can't stand him, the rest is wishful thinking. Only God knows the Hearts of men. And he (God) says its enough then everyone better be prepared to answer fo their own deeds-as for Bai, God also Loves Him but is giving Him time to repent and return this country normalcy. ONLY GOD KNOWS THE HEARTS OF MEN! Anon (3:15) Your so full of it and even the IG knows it, thats why they can't even put it to the vote. he did not have a stroke, he a had 'running stomache" and had to run to China to off-load. Cheers! It is obvious from this photo that the stroke has effected the right side; look at the side of his face, the clenched hand. It is very week as it can't stand on its own without leaning on a girl's shoulder. BAINI + MARAMA = WOMAN/LADY.... Maybe he is the MARAMA RUA! He should change his name to Maramabaini.